Campus gun laws in a US state are in the spotlight after a feminist cancelled a speech when a university said it would allow concealed firearms despite a threat to kill her and others in a mass shooting. Utah State University officials were set to go ahead with the event - with extra police - after federal and state officers said the threat was consistent with others made against Anita Sarkeesian when she gives speeches elsewhere. But Ms Sarkeesian, a well-known critic of the portrayal of women in video games, pulled out after learning from university officials that Utah law prohibits colleges from taking away concealed weapons from valid permit holders. It is the only state in the country with such a law. "It's sort of mindboggling to me that they couldn't take efforts to make sure there were no guns in an auditorium that was threatened with guns and a mass shooting," she said. "I don't understand how they could be so cut-and-dry about it." A police tried to track down who made the threat, Utah State University officials defended the measures they were set to take for the event amid criticisms from Ms Sarkeesian. "We feel that security would have been sufficient," spokesman Tim Vitale said. But he added that "she was the one who was facing the threatening email, and her concerns were expressed to us and we would never judge her on her decision". The university had planned to prohibit people from entering the 350-seat venue with backpacks and add extra officers in both uniform and plainclothes, he said. One state politician who has been vocal about gun rights defended the law. "I think she's overreacting," said Curt Oda, a Republican. "I hope they catch him and I hope they throw the book at him. But as far as permit-holders, they're not the problem." Utah is one of seven states that allow concealed carrying of weapons on college campuses, along with Colorado, Kansas, Mississippi, Oregon, Idaho, and Wisconsin, according to the National Conference of State Legislatures. Ms Sarkeesian said she was disappointed and frustrated that she would not be able to speak and called the situation ludicrous. "It was a threat about a school shooting that used very specific statements about the types of guns - and it's unacceptable," she said. She tweeted to her 168,000 followers that she is safe and vowed to continue speaking out against harassment of women in the video-game industry. The threat was sent on Monday night via email to dozens of university staff by a person claiming to have rifles, pistols and pipe bombs and vowing to kill feminists on campus, according to an email provided by Utah State. "This will be the deadliest school shooting in American history," it reads. Later it says: "Anita Sarkeesian is everything wrong with the feminist woman I will write my manifesto in her spilled blood, and you will all bear witness to what feminist lies and poison have done to the men of America." The sender claimed to be a student. But investigators do not believe the student was among the nearly 28,000 enrolled at Utah State. Today more than 75 students protested outside where the speech would have been held. 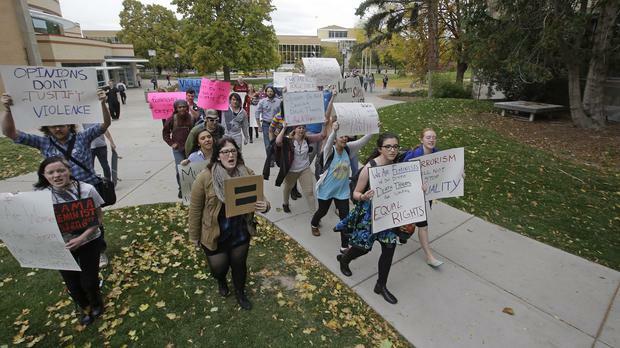 Mikaila Young, a 19-year-old from Idaho, held a sign that read, "We are feminists. We don't deserve death threats for wanting equal rights."